Their showy flowers stay low by the ground, sheltered by last years dry grass, to avoid spells of wind and cold. These plants are delicate: one strong rainshower or hailstorm and it is all over for a whole year. But isn’t all beauty inherently vulnerable? 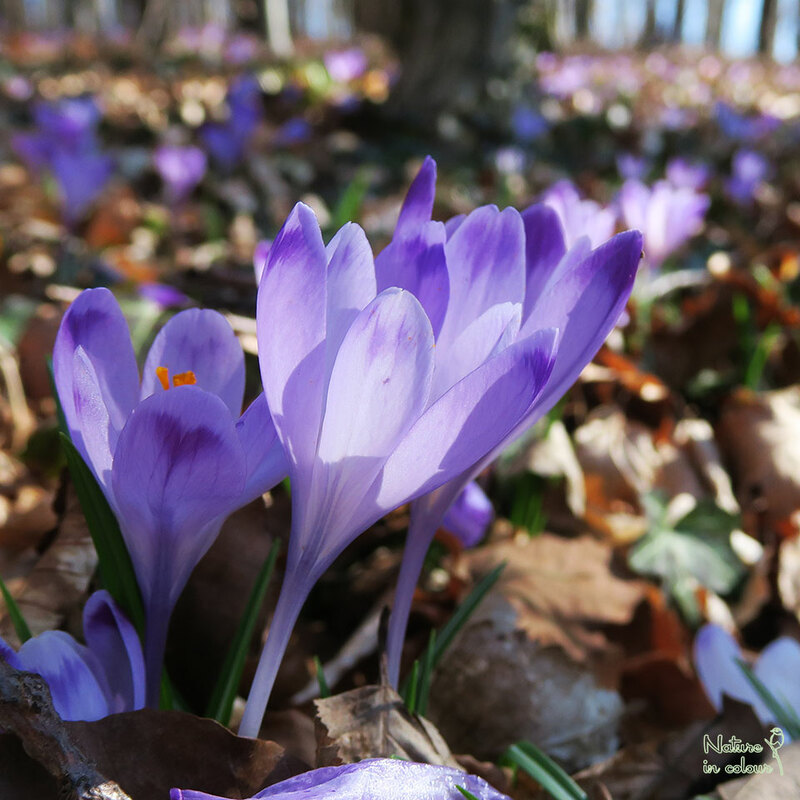 With their purple, pink and white colours, Crocuses are a much-awaited sign of spring for many Slovenians. Crocuses are well known as garden plants in most of the Northern Hemisphere, they are often planted in Slovenian gardens as well. Nevertheless, Slovenians are fortunate to know them in the first place as wild plants! 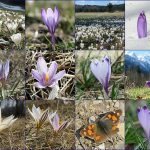 Of all Slovenian species, Spring Crocus, Crocus heuffelianus (formerly C. vernus ssp. vernus), is the largest one. It is also the wild ancestor of many garden cultivars. Usually, its flowers are purple-violet of one shade or another, with darker tips on the petals. Occasionally there are some white-flowered individual plants. This white colour is a genetic mutation and they are still recognisable as Spring Crocus by their large size. White Spring Crocus are uncommon, but because the colour is inherited, it is possible to find a number of them together. 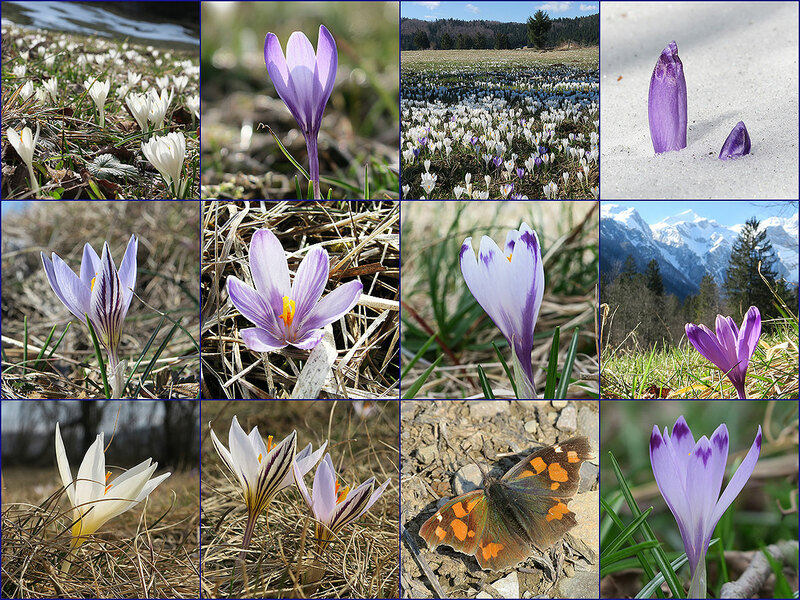 For the third Slovenian Crocus-species we have to go southwards, to the Dry Karst region, close to the coast. 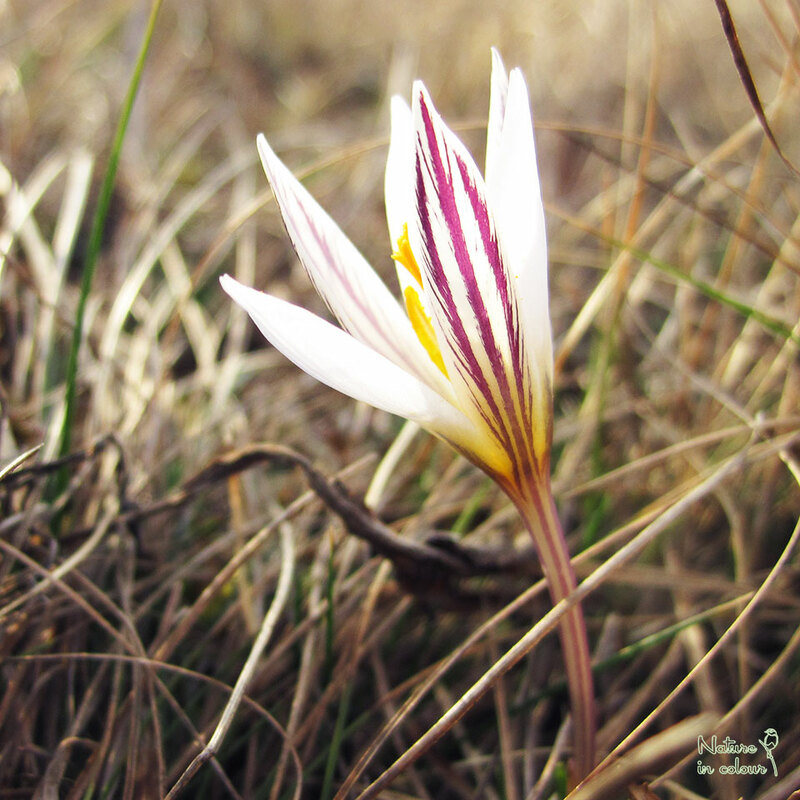 Here, we can find The Reticulate Crocus, Crocus variegatus (formerly C. reticulatus). This is a handsome little flower, which is named after a net-like structure around the bulb. The entire bulb, with this net-like structure, is normally underground. I never could bring myself to dig one up, so I have not seen the most important character of this plant. 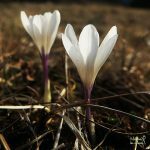 (Slovenian Crocuses are legally protected, so digging them up is illegal …) That is no problem for its identification: the outer petals of the flowers of Reticulate Crocus have a characteristic pattern of dark veins. This species is not rare but doesn’t form dense stands like the other Crocuses. Instead, individual flowers grow at some distance of each other. The Silvery Crocus, C. biflorus is an incredibly rare species in Slovenia and there are only a few places where it grows. Each of these Slovenian populations consists of only a handful of individuals. To see it, it is far easier to go over the border, either to Italy or to Croatia. 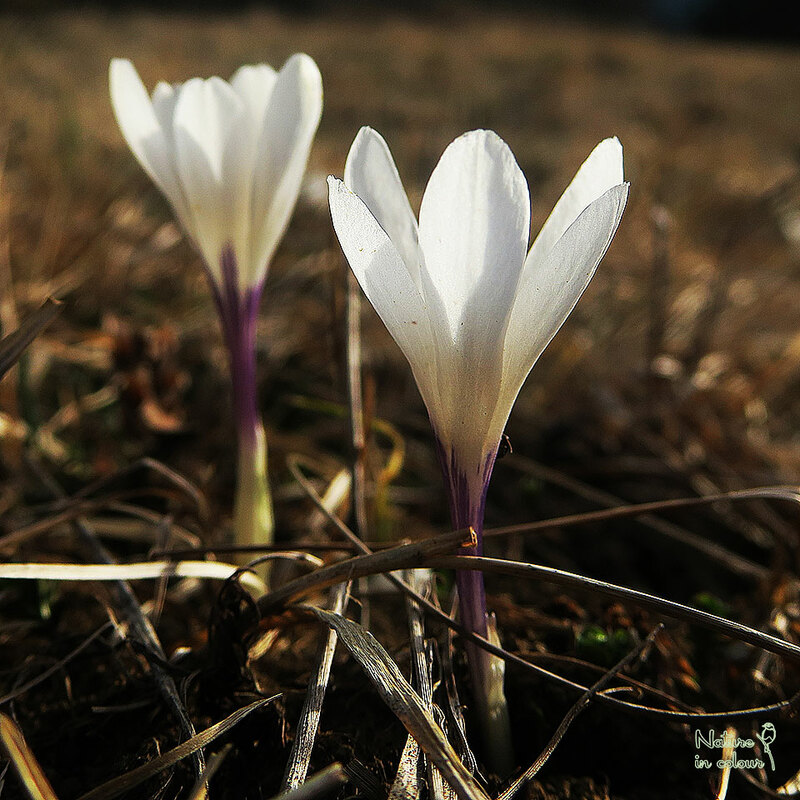 Silvery Crocus is adapted to a Mediterranean climate and can be found all the way to the extreme south of the Istrian peninsula. 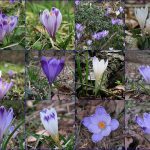 Because of the favourable climate, it can start to flower already in January, well ahead of any Crocus in Slovenia. 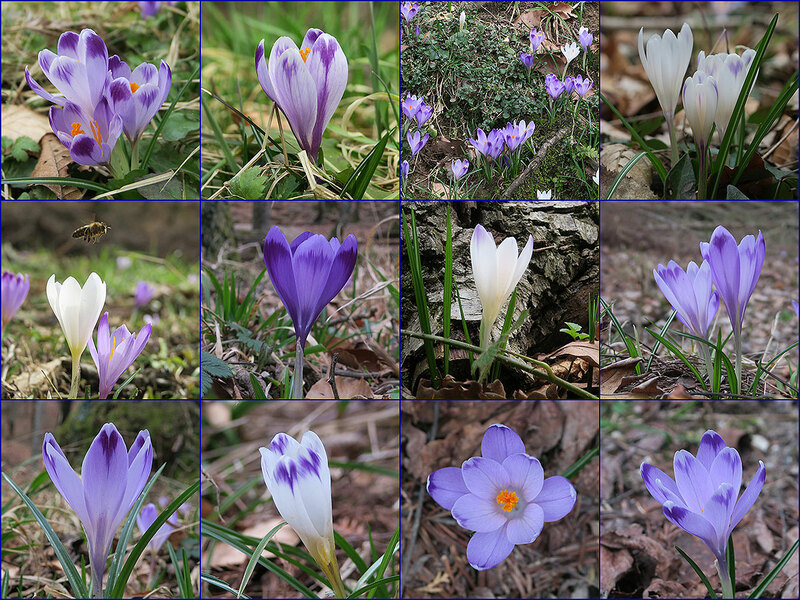 All true Slovenian Crocuses flower in spring. 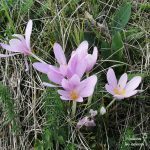 There is also a Crocus-like plant which flowers in autumn: Autumn Crocus, Colchicum autumnale. 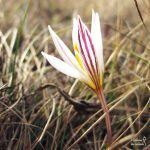 In spite of its appearance, the Autumn Crocus is not related to other Crocuses. After flowering, the above-ground parts of its flowers die. In the next spring, it reappears above ground like a bunch of fresh green leaves with a big seedpod in the middle. In turn, the leaves and seedpod die in summer so, in the next autumn, only fresh flowers appear again above ground. 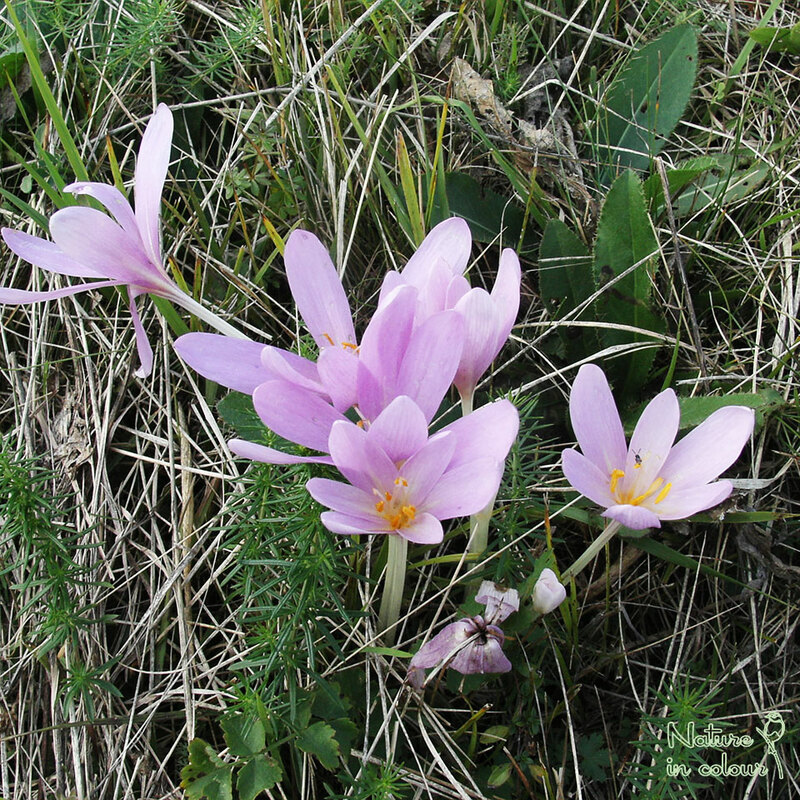 Autumn Crocus is one of the most toxic plants of Slovenia. Deer and cattle avoid eating it when they can. Unfortunately, there are known human fatalities, when its leaves were confused with Ramsons, Allium ursinum, which is a delicacy. In fact, true Crocuses are probably toxic as well, but their leaves are grass-like and don’t look like something which humans normally eat.